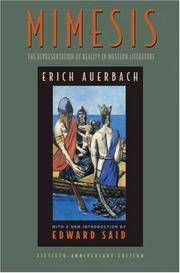 Auerbach, Erich; translated by Trask, Willard R.
Princeton, New Jersey, U. S. A.: Princeton University Press. As New. 1974. Paperback. 0691012695 . *** FREE UPGRADE to Courier/Priority Shipping Upon Request ***   *** IN STOCK AND IMMEDIATELY AVAILABLE FOR SHIPMENT - Text block pristine; pages unmarked and tight to spine - 563 pages -- with a bonus offer . Princeton University Press, 1/1/1953. Hardcover. Good. First edition and printing. Hardcover and dust jacket. Good binding and cover. Wear and tear to DJ. Stain to page 273-4 resulting in loss to affected text, otherwise, clean, unmarked pages. Ships daily. 2003-07-08. New. Ships with Tracking Number! INTERNATIONAL WORLDWIDE Shipping available. Buy with confidence, excellent customer service! DOUBLEDAY ANCHOR BOOK. Used - Good. Ships from the UK. Former Library book. Shows some signs of wear, and may have some markings on the inside. 100% Money Back Guarantee. Your purchase also supports literacy charities. DOUBLEDAY ANCHOR BOOK. Paperback. Good. Princeton: Princeton University Press, 2003. First edition thus. 8vo. 579 pp. Fine in Fine dust jacket. Introduction by Edward W. Said.. First Edition. Hardcover. Fine. Garden City: Doubleday, 1953. Very good condition with some minor signs of external wear. From the library of swiss - american - irish poet Chuck Kruger. With his name to front free endpaper. Occasional markings and annotations in the text.. Garden City, Doubleday, 1953. 11,5 cm x 18 cm. 498, (7) pages. Original Softcover. Very good condition with some minor signs of external wear. From the library of swiss - american - irish poet Chuck Kruger. With his name to front free endpaper. Occasional markings and annotations in the text. Contains among others the following chapters: Odysseus' Scar; Fortunata; The Arrest of Peter Valvomeres; Sicharius and Chramnesindus; Roland Against Ganelon; The Knight Sets Forth; Adam and Eve; Farinata and Cavalcante; Frate Alberto; Madame du Chastel, The World in Pantagruel's Mouth etc. Fondo de Cultura Económica, 2006-12-31. Paperback. Used:Good. Princeton University Press. Hardcover. 9780739454121 New Inside & Out. Clean & Crisp! No markings. You will be pleased. Excellent book! ( z1s107A ) Some very minor shelf wear on cover. ** Fast Shipping! ** . New. Princeton University Press. PAPERBACK. 0691012695 . New. Fondo de Cultura Económica, 2006-12-31. Paperback. Good. Princeton University Press, 1953. This is an ex-library book and may have the usual library/used-book markings inside.This book has soft covers. In poor condition, suitable as a reading copy. Princeton University Press. Used - Very Good. Great condition for a used book! Minimal wear. Princeton University Press. PAPERBACK. 0691012695 NEW BOOK - Same ISBN, different cover art -- Minor shelf-wear. ~ We Ship within 24 Hours + FREE Tracking, answer emails fast, accept returns & work hard to deliver 100% customer satisfaction! . New. 498 pp. Book intact in a tight cover. Some creasing on the spine. Age-toned pages. Several pages are underlined throughout the text. Previous owner's name at the top outside corner of the front free end paper. Francke Verlag, 1964. Hard Cover. Very Good/Fair. German edition! Tattered worn jacket. Very light pencil on several pages. Paperback. New. Shows how from antiquity to the twentieth century literature progressed toward ever more naturalistic and democratic forms of representation. This title offers the optimistic view of European history now appears as a defensive - and impassioned - response to the inhumanity he saw in the Third Reich. Princeton, NJ: Princeton University Press, 2003. 579pp. Fiftieth Anniversary Edition. . Later Edition, Fifth Printing. Paperback. Near Fine. 8vo - over 7¾" - 9¾" tall. Princeton: Princeton University Press, 1974. Translated from the German by Willard R. Trask. 563p., original stiff wrappers. Princeton University Press. PAPERBACK. This is a clean, solid, straight paperback book with clean, tight text pages, square corners, firm hinges, and an uncreased spine. The book begins by examining famous episodes in Homer and the Bible. It concludes by analyzing passages in Virginia Woolf and Proust. It discusses, in quite readable fashion, the different forms by which great European writers have shaped their ideas of reality. . Very Good. 1968. Princeton, NJ. : Princeton University Press. Very Good with no dust jacket. 1971. Soft cover. The Representation of Reality in Western Literature, Translated from German by Willard Trask, red pict. cvrs. ltly rubbed with lt crease mark at lower front corner. .
Princeton, NJ: Princeton University Press, 1974. pages dulled, yellowing. half the pages have foxing along edges. binding tight, hinges cracked. edge wear with dents, tears, chips. corners dented, starting to split. covers worn, dented, scratched, scuffed, ink rubbed, chipped, dulled, aged, back cover yellowed, ect. covers creased along spine edges from use. spine edges worn, creased, chipped, dented. general shelf wear. a good reading copy. . Fourth Printing. Trade Paperback. Fair. Princeton and Oxford: Princeton University Press, 2003. 1st Princeton Classics Edition. Translated from the German by Willard R. Trask; introduction by Edward W. Said. xxxii, 579p., original stiff printed wrappers (Princeton classics. Princeton University Press, 1968-05-01. Paperback. VeryGood. 9.0000 inches 6.1000 inches. First Edition / First Printing as identified with ""1"" in the full number line. Princeton University Press. PAPERBACK. 069111336X Very Good Condition. Five star seller - Buy with confidence! . Very Good. Princeton University Press, 1974. Soft Cover. Very Good. No markings. 563 pages. Translated by Willard R. Trask. Princeton: Princeton University Press, 1991. Paperback edition. Octavo. Paperback. Very good. illustrated wraps 563pp, cover slightly faded. Publisher: Princeton University Press. 1974. Trade Paperback. 563 p. Nice condition, with evidence of age and use. Condition: Nice condition, with evidence of age and use. Princeton University Press, 1974. Softcover. VG+. Spine head. Translated by Willard R Trask..
Princeton University Press, 2003. Soft Cover. Very Good. Faint water stain on lower edge of early pages. A few pen markings. 579 pages. Princeton University Press, 1968. Paperback. Good. Paperback. Pages are clean and unmarked. Covers show light edge wear. ; 100% Satisfaction Guaranteed! Ships same or next business day! Princeton Univ. Pr, 2003. Paperback. Very Good. Clean, sharp copy. 579 pages. Princeton University Press, 1968-05-01. Paperback. Good. Paperback. Text contains some pencil marking. Covers show light edge wear. Previous owners name on end paper. ; 100% Satisfaction Guaranteed! Ships same or next business day! Princeton University Press; First Edition Edition, 1953. Copy has mild shelfwear and some faint tanning on back cover. Title page has light crease and former owner's name. Pages of text are clean, bright and free of markings. Binding is tight and secure. ***Ships today or next business day. Our books are carefully described and packaged in boxes (not envelopes). A gift card and personalized message can be included upon request.***. Trade Paperback. Very Good. 8x5. Princeton University Press. Good+. 1968. Softcover. Wraps browned with light creasing and minor edgewear. ; 563 pages . Princeton University Press. PAPERBACK. 069111336X Fast handling - Orders prepared for Shipping Next Business Day! . Fair. Princeton University Press. PAPERBACK. 0691012695 Softcover with only light edge wear. Text appears unmarked and binding is tight. Ships FAST! . Very Good.